JUST IN: Police arrest former Jigawa governor – Royal Times of Nigeria. 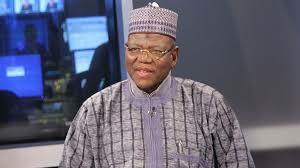 The police in Kano on Sunday arrested the immediate past governor of Jigawa, Alhaji Sule Lamido. A reliable source told the News Agency of Nigeria (NAN) in Kano that Lamido was arrested for allegedly inciting his supporters to stop the conduct of state’s upcoming local council polls. NAN reports that the arrest of Lamido may be connected with a programme aired on one of the Kano local radio stations. Lamido was alleged to have directed his supporters, during the programme, to ensure that they win the Local Governments elections by all means. The former governor was said to have been arrested at his Sharada Kano residence in the early hours of Sunday by the Zonal Investigative Bureau unit of Zone One Command of the Nigeria Police in Kano. When NAN visited the headquarters of Zone one located along BUK road, the former governor was still being held by the police who are yet to make any official statement on the issue. However, when contacted, the Public Relations officer, Zone 1, DSP Sambo Sokoto confirmed Lamido’s arrest. He said: “Yes I was told that the former governor was invited at Zone 1, but I was trying to get the details when you called me now, ” Sokoto said. He said that more details of the arrest would be issued to the press soon.